Think of the F-86 Sabre and most people think of the Korean War. It was the Sabre that managed to keep air superiority over the surprising MiG-15 that suddenly appeared in the skies in late 1950. 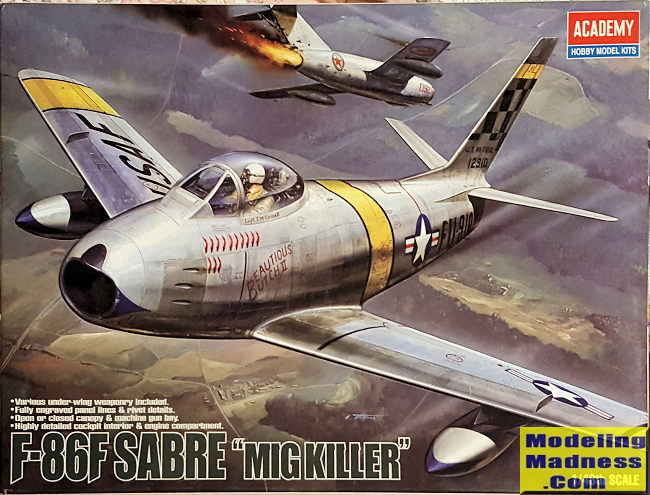 Built in very large numbers for the time, the Sabre was eventually exported to over 25 different countries, some of which only retired their F-86s in the late 1980s, over fourty years since the aircraft first flew. Today, several are being used by sportsmen and as target tugs. The F-86F-30 was brought into the conflict late and had several improvements over earlier Sabres. One thing that was needed was greater maneuverability. This was accomplished by deleting the leading edge slats and increasing the area of the leading edge of the wing. This was called the 6-3 wing modification as it was 3 inches wider at the tip and 6 inches wider at the wing root. Eventually, most F-86s, including older models, received this modification, and it was standard on later versions. Academy's kit is in light grey plastic with superb engraved detailing. It comes with two pilot figures, one standing and one sitting, a full engine, openable gun bays with guns, positionable speedbrakes, two styles of drop tanks, and an inner pylon with bombs. Also included are Sidewinder missiles and rails. Though these are not applicable to the Korean War versions, they would be if doing a Luftwaffe or Taiwanese Sabre. 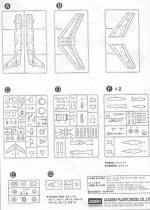 Should you decide to display the kit with the engine showing, you need to cut the fuselage. There is also a trolley for holding the rear fuselage half. The kit supplies the fighter-bomber instrument panel which is inaccurate for these two options, but it isn't a major deal. fighter version. There has been some speculation that the Academy kit is just a knock-off or copy of the Hasegawa kit. 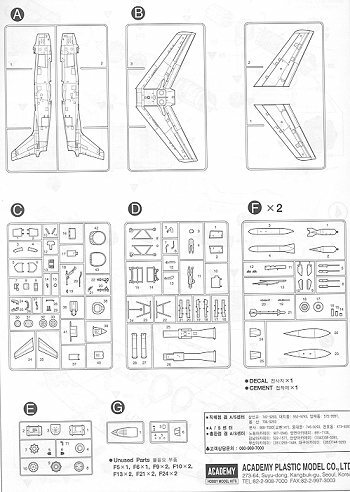 With that in mind, I purchased a Hasegawa F-86F-30 kit for comparison. There are a great many similarities, and also a number of differences. The panel sizes on the wings and fuselage halves are not exactly the same. Same goes for wheel well and speedbrake well detailing. The Hasegawa kit has a separate cockpit while the Academy kit molds it on the top of the upper intake trunk. Basically, they are not the same. Instructions are nicely done and offer generic color information. 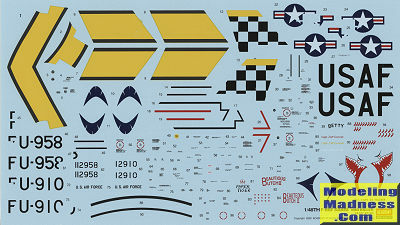 The large decal sheet has markings for two planes, both from the 39th FIS/51st FIW, which means they can use the same markings save for serials and nose stuff. Joseph McConnell's Beautious Butch is on the cover and the kit offers alternate kill markings so you can do his propaganda plane with just stars. The other is Harold Fischer's The Paper Tiger. Both are minimalist in unique markings and both are features on a lot of other kits and aftermarket sheets. Especially Fischer's plane with the shark mouth. Decals are nicely printed, and while they do fit, I've had some issues with them as they did not like setting solutions all that much. Not a problem for most of the markings, but may be an issue with the bands. My conclusion is that Academy didn't copy the Hasegawa kit. Like two or three companies doing the same Bf-109G, there are bound to be close similarities, especially if all involved are trying to be as exact as possible. Having built both the Hasegawa and Academy kit, there is not all that much to choose between them as both will make excellent models. Review copy courtesy of me and my wallet!! If you wish your product reviewed fairly and fairly quickly, please contact the editor.